We are big fans of charcuterie in all its forms. Cured meats, sausages, pâtés - we buy them when we see them, seek them out when dining in restaurants, and have had some modest success creating them at home. Here is a collection of some of the experiences we have had making our own charcuterie. We encourage you to give it a try as well - it is easier than you might expect. This was our first foray into the world of charcuterie. It turned out wonderfully, and so has every batch since. 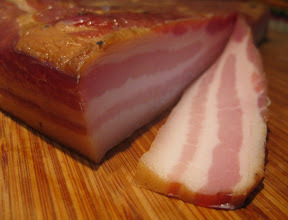 Pancetta is an ideal first step in curing meats as it simple and relatively tolerant of non-ideal temperatures. 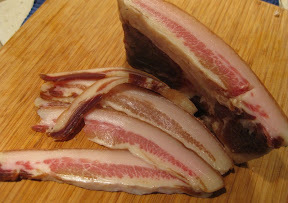 Even easier than making the rolled version ("arrotolata"), Pancetta Tesa tastes every bit as good and can be made without any special equipment or curing environment. In which a humble pork shoulder is transformed into something spectacular. Perhaps our favorite cured meat. 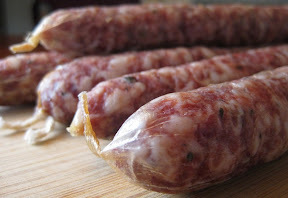 Saucisson Sec is about the easiest cured sausage you can make, but that doesn't mean it doesn't taste fantastic. 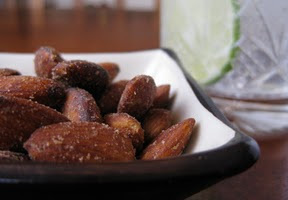 The complexity of flavor you get belies the simplicity of the ingredients. 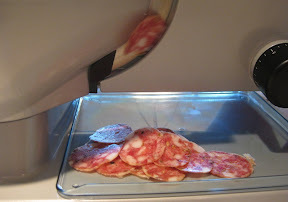 Tuscan Salami was our first experience with making a fermented sausage. 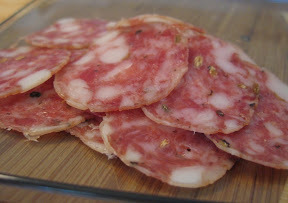 The fermentation process gives a salami that fantastic twangy bite. 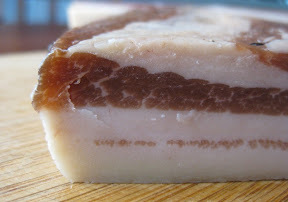 Homemade Guanciale is what you make when you happen to have pork jowls on hand. 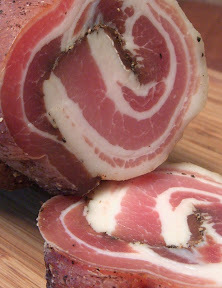 The process and end product is very much like Pancetta. 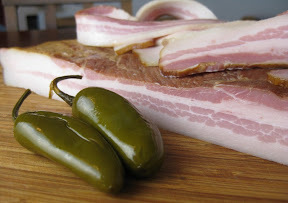 When we made our first batch of homemade bacon several years ago, I proclaimed that we would never buy bacon again. A fun twist on bacon. The heat from the Jalapeños adds complexity without being at all overwhelming. Best ham we've ever had. Smoky and succulent. Easy and inexpensive. We fell in love with Andouille in New Orleans. Unable to find a good version at home, we decided to make our own. You should, too. 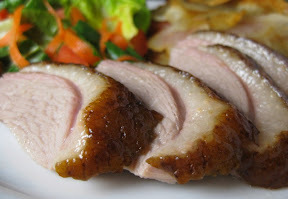 Smoked Duck is truly one of the best things in the world - especially when it comes straight off of your smoker. Move over smoked salmon - smoked trout is a force to be reckoned with. We love it straight up, or packed in olive oil and stored in the fridge for later - especially for breakfast. I bet you can't eat just one. 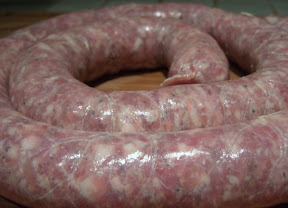 Probably the most simple thing you can do to enter the realm of charcuterie is make your own sausage. Italian sausage is a good place to start. 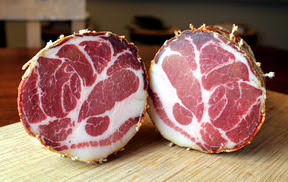 Coppa di Testa is Italian for head cheese, and head cheese is English for awesome. 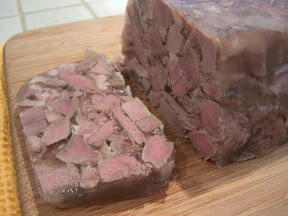 Pig face terrine is a good thing - especially served on toast. Curing meats is all about environmental control. 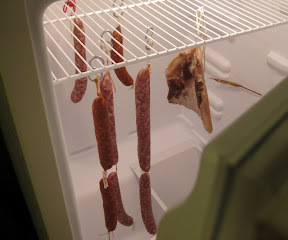 We converted a cheap fridge into our curing chamber. It is easy to do, and does double duty as our draft beer system! One of the best purchases we've ever made. 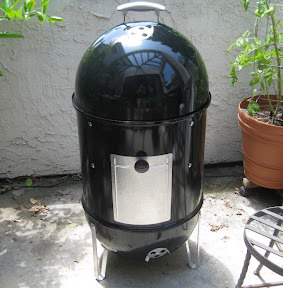 Our WSM has seen a lot of use in the few years we've owned it. Cured meats need slicing. We picked up a Chef's Choice 610 Premium Electric Food Slicer from EdgeCraft and have been very happy with it. 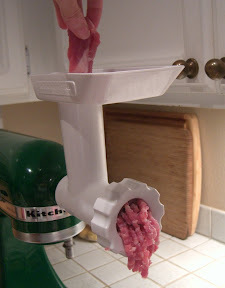 We grind all of our meats for fresh, smoked and cured sausages with a KitchenAid attachment. We used to use the KitchenAid for stuffing as well, but we have since moved on to a manual Northern Industrial stuffer. This was the book that got it all started for us. 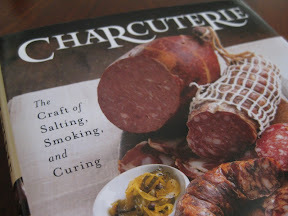 It is a great introduction into the wonderful world of all things charcuterie. 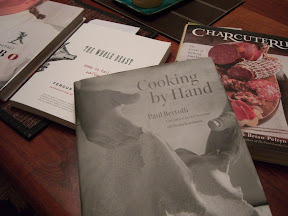 Not primarily a charcuterie book, but with some great inspirations on the subject. 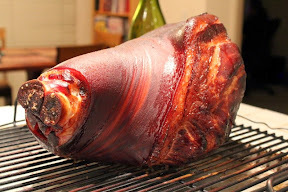 This was our main reference when making Coppa de Testa. 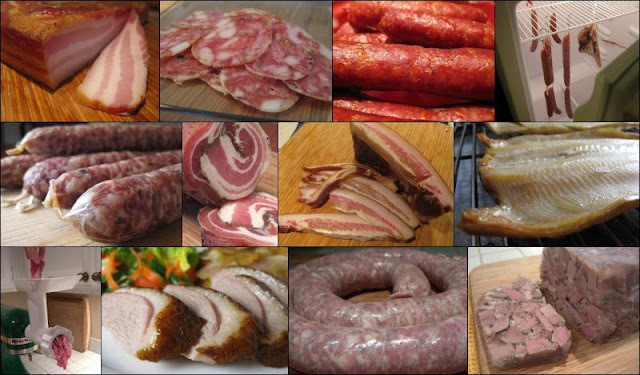 An almost silly number of recipes for fresh and cured sausages. An inspirational treatise on all things offal. Thanks for visiting my blog. Vietnamese head cheese has pig ear's for crunch. And whole black peppercorns. Yum! I'm not sure what else my family puts in it but our version is dark, while some store-bought head cheese is pinkish ham colored. My dad's a hunter so I get lots of venison. I just prepare it as I would beef actually. Anyway, I've been checking in sporadically with your road trip. Looks like fun. I went from Oregon to the East Coast when I was 15 and it was an interesting experience. Especially when packed into a bus with a bunch of other teenagers from Idaho and Nebraska. We went the Midwest route, but I think Southern would have been a whole lot more interesting. Wandering Chopsticks - head cheese and banh mi sounds like a good combo! Speaking of the Vietnamese angle, a by-product of making testa is that you get a bunch of very gelatinous stock. The flavor profile is kind of like that of Pho' broth, so we've used it to make a non-standard, but quite tasty "Faux Pho'". Mike I note the very high quality of your pictures. Couple of questions for you a) are you a professional b) what equipment are you using and c) any tips on how to take good pikkies like yours. By the way i am interested in the food; but I also take pikkies of my efforts as well for my collection. Grazor, I'm somewhat ashamed to admit that my photography rig is far from sophisticated. My camera is a little Canon Digital Elph. The key, for me, is using the macro setting for close-in shots (which is most of what I take for the blog), and good lighting. For the latter, I often use a Lowel EGO light. Hi Grazor - it is a good kind of monster :-) Your bresaola looks great! 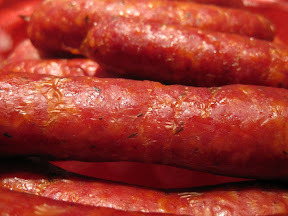 Great sausage and charcuterie recipes and experiences you are sharing here. I have been documenting my own efforts at nungkysman.wordpress.com although I havent been active for a couple of years since moving county and job! I think your site has inspired me to start again. Thanks! Thanks, nungkysman, and good luck with your future charcuterie exploration! Very nice and informative site! I love charcuterie and all the time and patience that goes into proper preparation. The one thing that is missing is a rillette recipe though. It is great to see another person that has appreciation for old world traditions. Great pictures and recipes, they take me back to my days of culinary school. We've not yet made rillets, but I agree, it is something we need to try.